Does HeroScribe run on my OS? When I try to open HeroScribe, the Nokia PC Suite opens! How do I run HeroScribe under Ubuntu? HeroScribe cannot open any XML file! When will you release next version of HeroScribe? 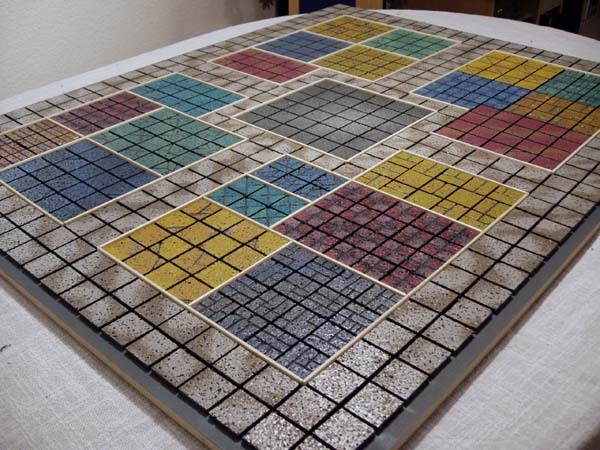 Where can I find the original HeroQuest maps for HeroScribe? Is there the x icon? Can I customize the existing icons? Can I add new icons to HeroScribe? How do I convert raster to vector? My icon is off-center, how do I true it up? Can I add new boards to HeroScribe? Can I add new rooms and passages to the board? Can I use the "german", double corridors version of the board? Can I add text to quests? How can I print quests? How do I edit high quality, .eps quests? How can I manually edit XML files, and... should I? I downloaded an Icon Pack from HeroScribe.Org, how do I install it? I want to use two Icon Packs together, how do I do that? I downloaded the All-In-One/Just Boards Icon Packs, but how do I switch board? I want to easily choose between two boards, how do I do that? HeroScribe runs on GNU/Linux, *BSD, Mac OS X and Windows. When Nokia PC Suite is installed on Windows, it gains control on the .jar extension (the one used by java applications); that Nokia utility will open any .jar file, making it impossible for HeroScribe to run. To solve the issue select Folder Options, search for .jar under File Types tab, then click Change and choose Java(TM) 2 Platform Standard Edition binary. The Nokia utility, now, will not run any .jar files and HeroScribe will start up as wanted. HeroScribe requires the Java Runtime Environment: please download it and install it in order to start HeroScribe. Please note that values for -Xms and -Xmx are based on the RAM you are running on your system and are expressed in MB. Once the edits are done just run HeroScribe by double clicking HeroScribe.bat; such file is already included in the All-In-One, the biggest Icon Pack out there hence the one which is possibly causing your HeroScribe not to run. Might change according to the Java Runtime Environment version installed on your system. We are aware of this issue; it started with the release of Java Runtime Environment 1.6, which throws an exception when trying to parse an XML file whose path contains a space. Developers at Sun fixed this bug, please download the latest Java Platform to solve the issue. If the issue persists, you might be trying to open a quest featuring icons your current HeroScribe is not including. Try downloading and installing the All-In-One Icon Pack from the Icon Packs Section, then reopen the .xml quest: a popup will tell you what icon is missing in HeroScribe. With the Icon Packs being more than 50, when releasing .xml quests authors should declare the Icon Pack used, if there was any. Unfortunately, we do not know. We could not find time to work on it in the past years, and cannot provide a release date for now. You may find the original HeroQuest maps in the XMLs Section. Please be aware these files are not intended as a challenge to the rights of the Milton Bradley Company/Hasbro, Inc. in regard to HeroQuest. Please refer to Objects.html (available in the HeroScribe install folder or by clicking Help -> Objects... in HeroScribe) for any icon information. As said before, HeroScribe uses vector graphics to achieve an ad-libitum scalable output quality. You may modify an EPS found in HeroScribe but you might need our help to convert it to an Icon Pack. We will be glad to help you out, just read carefully the instructions available on the Icon Packs Section. If instead you would like to convert it yourself, please read the FAQ at Can I add new icons to HeroScribe? Yes you can! On the Icon Packs Section you will find many new monsters, rooms, furniture and traps to add to your Quests. Shall you want your own icons included in an Icon Pack at HeroScribe.Org, please carefully read the instructions available on the Icon Packs Section. Please note that adding raster images to HeroScribe would be highly unproductive: we spent time converting original HeroQuest icons from raster to vector graphics, and as a result the final product is closest as possible to the original one; that is why importing raster images would not allow the ultimate product's top quality, and why we will only accept vector icons for your Icon Pack. Then you will need to download the 32-bit version cygwin setup available on the official website; cygwin is a brilliant collection of unix-like tools which will help you handling the whole conversion of your icons. As its development has been continuously growing through the years, while HeroScribe has not, we will need to use an older setup of these tools: where can you download it, then? Well, here of course (it's about 60MB). Please note that older version of cygwin might need the old setup package available here. Are we done yet? Nope, we are at the starting gun. Also, please note that you will need to extract the latest HeroScribe in your personal cygwin folder (remember the hypothetical C:\cygwin/home/Dewayne?) and rename it to HeroScribe (as in C:\cygwin/home/Dewayne/HeroScribe); that way it will be easier converting your icons and checking if everything is working fine. Are we done yet? Nope, we just made sure to start after the starting gun. Race has just started. Please note that the filename schema does the matter: if you follow it (Icons/Vector/Europe/IconPack/IconPack.IconName_EU.eps and Icons/Vector/USA/IconPack/IconPack.IconName_US.eps) everything will be faster when you insert references inside Objects.xml. By not following this simple schema, things will get a bit harder. Your icon will now be listed under Add object -> Men-at-Arms. If you want to update your Objects.html so that it includes your new icons, start up the cygwin terminal by double clicking Cygwin then type python 4_html.py and hit Enter (or type python 4 then hit TAB and Enter); this will automatically edit C:\cygwin/home/Dewayne/HeroScribe/Objects.html - and that's it. The last remaining script is 5_check.sh: what does it do? While working on your personal icon pack, you might handle over dozens of icons: that may lead to some errors in the editing of your Objects.xml file; if that occurs, HeroScribe will not run and you will not be able to know at once what is going on there (unless you have installed one of the latest Icon Packs - the All-In-One, to name one - in that case you will be told what is going wrong). That is what the checking scripts does: start up cygwin (double click on the shortcut), then hit sh 5, TAB and Enter; the terminal will tell you what you need to fix in order to run HeroScribe with your icons. That's it, you won the 100-metre dash! Here you will find the most common HeroQuest icon shapes. Ok, are we done yet? Nope, you still need to color your icons for the north-american layout of the map. Again, please not the filename schema does the matter: if you follow it (Icons/Vector/Europe/IconPack/IconPack.IconName_EU.eps and Icons/Vector/USA/IconPack/IconPack.IconName_US.eps) everything will be faster when you insert references inside Objects.xml. By not following this simple schema, things will get a bit harder. Remember to change YourIconPackName according to your needs. Once your icons are ready inside C:\cygwin/home/Dewayne/Icons/, just run the sh 0_heroscribe.sh script inside the cygwin terminal, paste the results inside C:\cygwin/home/Dewayne/HeroScribe/Icons/ and make the relative changes in C:\cygwin/home/Dewayne/HeroScribe/Objects.xml; you will need to choose the category for your icons, and adjust their offsets if they don't perfectly fit in the center of the square/s they occupy. Your icons are now ready to be used! The opensource way we suggest is Inkscape; please follow this simple tutorial to vectorize your icons. xoffset being the horizontal offset from the icon center and yoffset being the vertical offset from the icon center; if icon is 2x1 squares wide, its center will be at 1,0.5 - if icon is a single square wide, its center will be at 0.5,0.5. 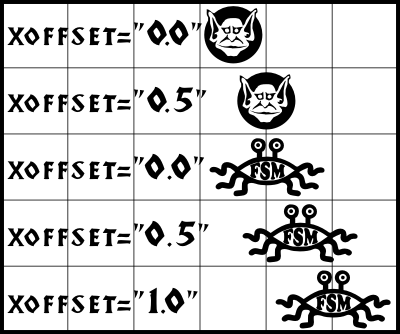 Offset units refer to the HeroQuest square: 1 being the entire square size, 0.5 being its half and so on. In the following case we are moving the Goblin by nothing (xoffset="0.0": 1x1 icon is centered in a square) and by 0.5 square (xoffset="0.5": icon is shifted half square to the right); we are also moving Flying Spaghetti Monster by nothing (xoffset="0.0": 2x1 icon is centered in two squares), by 0.5 square (xoffset="0.5": icon is shifted half square to the right) and by 1 square (xoffset="1.0": icon is shifted a square to the right). Transparent, wooden areas show the icon size: Goblin is a single square wide, the more powerful Flying Spaghetti Monster is a 2x1 squares wide. If you would like to perfectly center your icons download these offset icons: there you will find icons ready to be pasted inside your HeroScribe folder and the .xml file including the necessary edits you will have to make inside your Objects.xml. Once installed, create a new quest map with only your icon and the relative sized offset icon on the behind, so that when you export the quest in .pdf and zoom in, you may see how much the offset will need to get tweaked. Save the map both in .pdf and .xml, close HeroScribe, make the relative offset changes inside Objects.xml, restart HeroScribe, load and resave both .pdf and .xml and look if your icon is centered - if it is not, keep changing its offset until needed. Yes you can! On the Icon Packs Section you will find many new boards for your Quests! If you would like to personally work on your board without including it in an Icon Pack available here, you will need to follow an in-depth guide to create it yourself. Yes, you can! Please download and install the SemiModular Icon Pack off the Icon Packs Section. Yes, you can! Please download and install the Mini furniture/German board Icon Pack from the Icon Packs Section. Actually, in HeroScribe you cannot. You may want to add it through your own graphics software, or could give a look at the HeroScribe Enhanced website. Please be aware that we cannot provide any help regarding HeroScribe Enhanced since it is not developed by us. Alternatively, you may want to try HQ Quest Maker, a new handy tool that allows to import HeroScribe-made maps and then create and edit Quest's notes; though it works only on low quality PNG images, it is becoming quite popular. HeroScribe produces EPS/PDF files (highest quality) and PNG files (lowest quality that could be used as a quest preview). 3) Open the EPS file through GSView and print it. PDF files can be opened by Adobe Reader and many other programs, such as web browsers (if any PDF plugin is installed). PNG files can be opened by any graphics editor; we advise XnView. That's for those who have Ghostscript 9.04 installed on their Windows system, but you will need to tweak it if that's not your case. Now you will finally be able to open .eps files within Inkscape. XML files can be opened by any text editor, such as NotePad++ or TextEdit. There are various reasons why you may need to manually edit XML files: decimal position of objects (that is also possible directly in HeroScribe, if you download any of the latest Icon Packs, like the All-In-One), or batch conversion of several quests. I downloaded some Icon Packs from HeroScribe.Org, how do I install them? Every Icon Pack comes in a .zip file; you will need to extract it inside the HeroScribe setup folder (usually, C:\Program Files/HeroScribe) in order to enable it. Shall you need two or more Icon Packs installed simultaneously, you will need to include image files from every Icon Pack (Raster, Sample and Vector, both European - Europe - and American - USA - versions) and have them referenced under a category in the ultimate Objects.xml (open the Icon Pack's Objects.xml and copy the reference between the <object></object> tags of the wanted icon inside the ultimate Objects.xml - remember to include the <object> tags, too). XML files can be opened by any text editor, we suggest NotePad++, TextEdit. There is no Nazgul icon in any official HeroQuest release. This icon was created by Yon. Revised by Derfel Link. This is how the ultimate Objects.xml should look like. Again, you will also need to include all relative images (Raster, Sample and Vector, both European - Europe - and American - USA - versions) inside the Icons folder for this to work. When using one or more Icon Packs together, please be aware that HeroScribe will not run if there are two or more icons by the same id. August '12 update: it is now possible to switch boards directly inside HeroScribe, just be sure to install the All-In-One Icon Pack 1.0.38 or above. As for the older HeroScribe/Icon Packs' versions, when you want to switch boards choose the one you would like to use in HeroScribe and copy the <board> code from the relative .xml file, then replace that code in the original Objects.xml from the HeroScribe folder. Objects sample.xml is how the original /HeroScribe/Objects.xml should look like if you want to use the Dragon Strike City board inside HeroScribe. To switch back to the original HeroQuest gameboard, just copy the <board> code from /HeroScribe/Boards/HeroQuest.xml inside the <board> code section of /HeroScribe/Objects.xml. Please note that in /HeroScribe/Boards are shown previews for all the boards available in HeroScribe (the board square size is shown in filename). As for the older HeroScribe/Icon Packs' versions, drathe from Ye Olde Inn recommends creating two additional folders within the HeroScribe folder. Name one 1st Board (or whatever you like) and the other 2nd Board. Inside each, store a copy of Objects.xml, Icons/Raster/Europe/Board_EU.png, Icons/Raster/USA/Board_US.png, Icons/Vector/Europe/Board_EU.eps.gz and Icons/Vector/USA/Board_US.eps.gz files; one set for your first board and the other for the other one. Then all you have to do is copy and paste the contents into the main HeroScribe folder before loading the program when you want to switch.